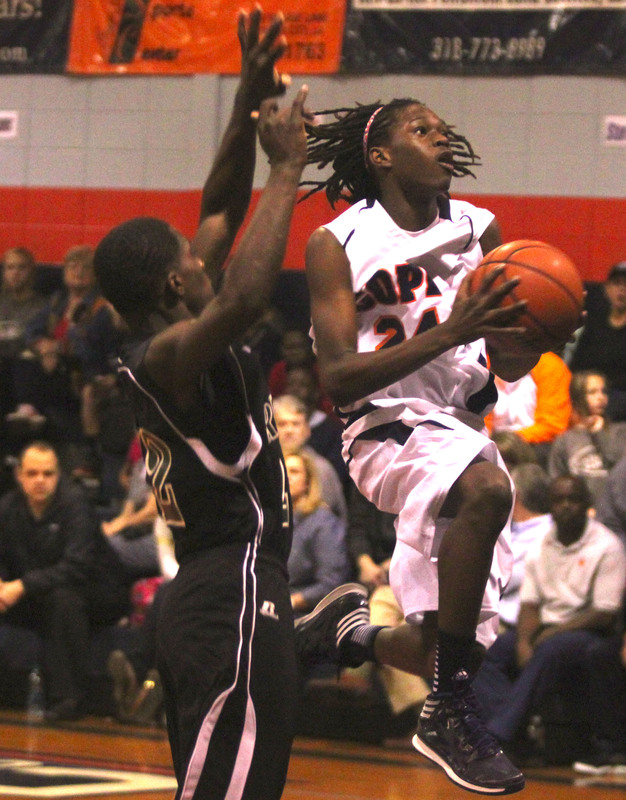 The Cope Cougars clinched the Bossier Parish boys basketball eighth-grade district title with a 40-29 victory over the Rusheon Rams Monday at Cope. The Cougars improved to 9-0 with one game left on Thursday. Rusheon dropped to 7-2 with its only losses coming against Cope. In other eighth-grade games, the Haughton Bucs downed Greenacres 40-33 and the Benton Tigers dropped Elm Grove 39-15. In seventh-grade action, Rusheon handed Cope its first district loss, 43-35, preventing the Cougars from clinching the outright title. Cope (8-1) can still win it outright with a win over Benton Thursday. If Benton wins and Rusheon (7-2) defeats Greenacres, then Cope and Rusheon will share the title. In other seventh-grade games, Greenacres downed Haughton 40-23 and Elm Grove topped Benton 32-29. At Cope, the eighth-grade game was tight in the first quarter with the Cougars taking an 13-9 lead. Cope began to pull away in the second quarter, taking a 25-17 lead at the half. The Cougars extended the lead to 33-20 at the end of three. Quillin Dixon and Jason Owens led Cope with eight points each. Trenton Ivy chipped in with six. Isaiah Wallace paced Rusheon with 13 points and Keshawn Jones added 10. Cope’s Quillin Dixon takes the ball to the basket during the Cougars’ eighth-grade victory over Rusheon Monday at Cope. Cope dominated the first 16 minutes of the seventh-grade game, building a 31-16 lead. But the Cougars went cold midway through the third quarter and the Rams turned up the defensive pressure, forcing several turnovers they turned into easy layups. Cope still led 33-21 going into the fourth quarter, but there was no stopping Rusheon. The Rams dominated the final six minutes. Jacoby Decker scored 10 of his game-high 15 points in the fourth quarter. Ja’Nron Rogers scored six of his 12 in the quarter. Donnie Williams hit a 3-pointer and finished with nine points. Brenden Moseley hit a 3-pointer in the fourth. Kamren Davis led Cope with 13 points. Kaalas Roots added 10 and TJ Robinson eight. At Elm Grove, Chase Turner led the victorious Eagles seventh-grade squad with nine points. Alec Crain added seven. Craylon McGee scored four to lead the Elm Grove eighth-grade team. Benton’s highlights were not reported. At Greenacres, Lavonta Gipson and Jalob Walker scored nine points each to lead the Haughton eighth-graders to the win. Nick Heckman had eight. Decarrio York topped the Haughton seventh-graders with seven eight points.